IMM Cologne is one of the most important furniture and interiors design events in the calendar. Held in the second week of January in Cologne, one of Germany's most unique cities, split by the river Rhine, innovation and technology remained the mainstay of the fair. Here are some key observations from the fair. Awaken early 20th century architectural styles in interiors. Boho chic shake up. Elements pushed together to create unexpected new experiences. To tell stories. Ehtnic patterns, cane elements, black and white images, and colourful fabrics with contemporary design. Past and present combine to make a new way. Trend colours. Rust/brick red was easily the colour of the season, with the tone dominating marble tops, fabrics, leather and various other surface finishes. Olive green, warm blue remain favourites, and heartwood, the red tinted warm grey, is another colour being used in walls and larger surfaces, adding more character. While ultra violet, the fashion colour of the year, found its way into some aspects of interiors, a mixed palette of pastels were most notable. Duality in materials. Velvets. Suede. Concrete. Metal. Walnut and oak remain favourites, but in a range of tones. Forget minimalism, think order, simplicity and strokes of unexpected harmony. Simplify the old to build a new language. Sustainability is a way of life. Steel enamel, ceramic, natural stone, marble, natural fibres. Materials that last long, reusable products, and low carbon footprint production is key. Be natural. Integrating living plants into a space, no matter the size of the room, and green, or rather, a band of green hues. Bathrooms are now fashion statements with individual design elements in the space. Gone is the safe play of warm tones and marble on walls. Linoleum returns in tabletops, sideboards and cabinet inlays. Solid wood grows in stature - tables, cupboards, sideboards and even sofas - in elegant, balanced forms. Smart homes. Digital links to almost everything in the home. Things to use, and to set your creative spirit free! The primary hangout spot in most homes is the sofa where reading, working, lounging, and having friends and family over is a habitual part of everyday life. When such is the scene, all of us want to make sure that our sofas are stylish, functional, and makes everyone feel cosy. 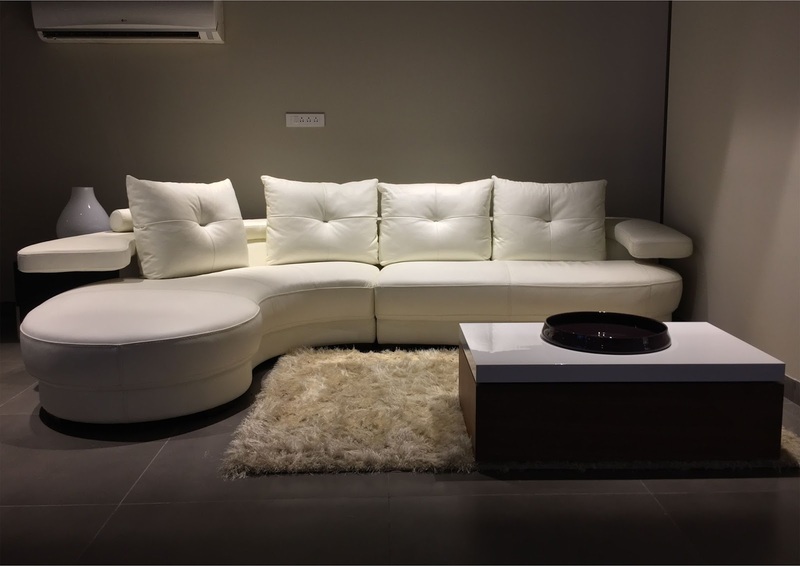 Here are 6 sectionals that go with any style of living room with an option of materials, colours, shapes, sizes, and extra features to choose from. Sofas tailored to match your needs because you deserve the best in the world. Winner of the prestigious Red Dot Design Award, the Guadalupe sectional sofa sports the look of gently rounded, colourful islands. With varying seating depths and add on elements, Guadalupe is available in different colours and upholstery choices. Polished aluminium mini-sleds to support and enhance the overall aesthetics. A design by Christian Werner for Leolux. There's a sofa for those who like to customise every single detail. 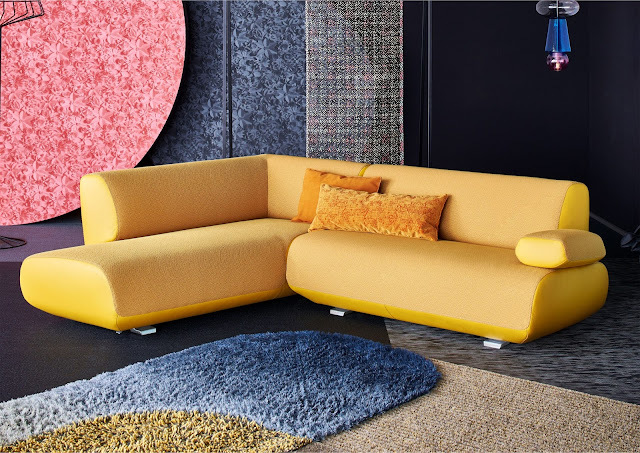 Melpot is an extremely modular and versatile sofa for your living space which can be arranged as a sofa, loveseat, chaise longue or sleeper with removable cushions in fabric and leather. The sofa also comes with the options of poufs, drawers, bookshelves and shelves. . 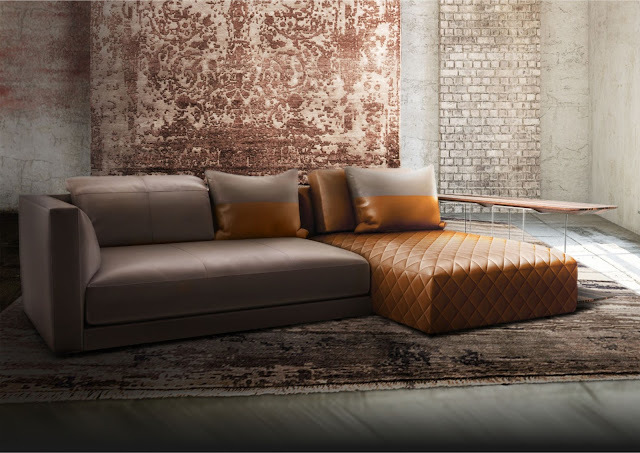 Designed by Mauro Lipparini for Natuzzi. 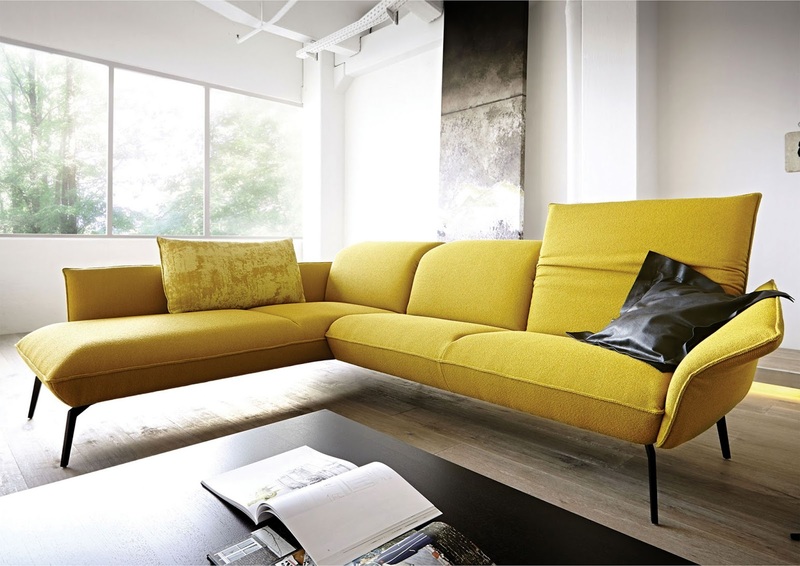 Flirt sectional sofa by Koinor is graceful and elegant with soft, padded spaces that invite you to linger longer. The sofa offers high-backed sitting comfort, soft-squishy armrests that can be angled as desired and sleek legs for weightless lightness. Designed by Tamara Haerty. Those of you who love fabric sofas, here's Fama's charming combination of simplicity and elegance - Manacor corner sofa. Thanks to its multi-positional plush back cushions, it lets you discover the resting position that's perfect for you. The wide seats allow you to sit deep in, straight up, or lie back and relax comfortably. Stylish and contemporary, this sectional sofa by NicolettiHome features a streamlined design that works well in a variety of interiors. 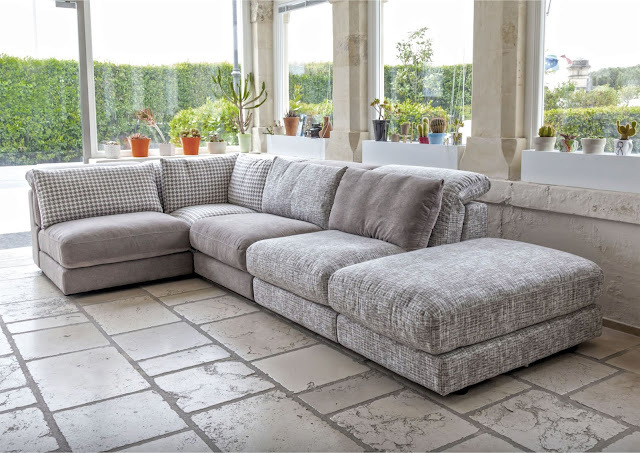 This fabric sofa has adjustable headrest with removable seat and back cushions. Gorgeous in white, the Paris sectional leather sofa with a rounded chaise longue, an elevated backrest, and roller booster cushions. A true beauty by Becker. Explore our wide range of sectional sofas here. And, like we always say, do visit our stores to experience our luxe sofas. For special offer visit our stores: The So Fa So Good Sale is on. Up to 30% off. Offer valid till February 28, 2018.